Yogurt mixed with fruit. Can’t get more nutritious than that, can you? Well, depends on what your definition of “fruit” is. 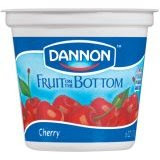 Unfortunately, the fruit contained in “fruit on the bottom” yogurt is pure jam. In other words, take fruit, remove fiber, and add 2 tablespoons of sugar. By the way – the only reason why those three sweeteners are listed separately? If they were lumped together as “sweeteners”, they would be the FIRST ingredient on the label! Keep in mind that added sugar (in the form of fruit jelly) means more calories. For example, a six ounce container of plain yogurt with a half cup of fresh strawberries adds up to 104 calories. A six ounce container of strawberry flavored fruit-on-the-bottom yogurt provides 50% more calories, zero grams of fiber, and 90% less vitamin C.
Undoubtedly, you are better off buying regular yogurt (preferably low or non-fat and without much added sugar) and adding your own fresh fruit. If that’s inconvenient, add whole grain cereals like Grapenuts, Kashi, or Total to your yogurt to boost its fiber, vitamin, mineral, and antioxidant content.